Our motto at dental department is to provide painless quality dental treatment with strict infection control & under aseptic conditions at affordable costs. 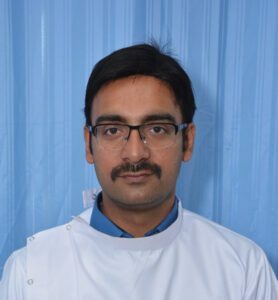 Dr. Abhishek has completed bachelor in dental surgery (BDS) in 2006 from Rajiv Gandhi university of health science, being along with one year of internship at Govt. dental college & Hospital, PGIMS, Rohtak. He has worked for three Years after that from (2007-2010) in prestigious PGINS, Rohtak institute and gained command over various Dental technique and surgeries and worked with expert faculty. He has got certification in dental implantology from Max super specialty insitute & Hospital SAS Nagar Mohali in 2014.